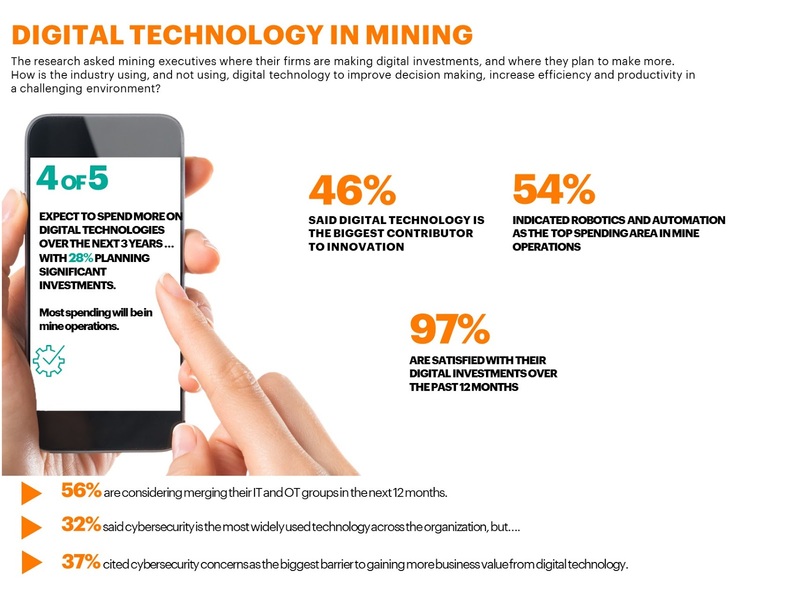 Four of five mining and metals companies expect to increase their spending on digital technologies over the next three years, with more than one-quarter (28 percent) planning significant investments and almost half (46 percent) citing digital as the biggest contributor to innovation, according to new research from Accenture. 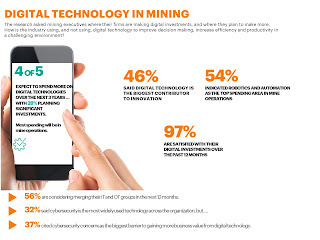 Based on a survey of approximately 200 mining and metals executives and functional leaders worldwide, the Digital Technology in Mining report shows that the convergence of information and operational technologies (IT/OT) and adoption of cloud computing are advancing the digital agenda, prompting the need for more-stringent cybersecurity measures. Mining and metals executives said their companies have applied and will continue to apply digital technology over the next three to five years predominantly in mine operations, but also in exploration, mine development and other areas. Most of the investments in mining operations target robotics and automation, named by 54 percent as a top spending area, along with remote operating centers, drones and wearable technologies, each at 41 percent. “Our research confirms that mining and metals companies are investing in digital led innovation to help them improve operational efficiency, and address issues such as rising capital as well as compliance costs,’ said Sandeep Dutta, Managing Director and Lead, Resources, Accenture in India. Organization-wide, the most often cited benefit from current digital technology investments was improved workforce productivity, driven most by mobile/tablet devices (32 percent), automation of mobile and/or fixed assets (30 percent) and simulating physical environments (30 percent). Cost savings across the organization ranked lower as a benefit than improved workforce productivity in general. Asked to identify the top three barriers to gaining more business value from digital technologies, executives most often cited cybersecurity concerns (37 percent), followed by volatile commodity prices (29 percent), internal data management capability (27 percent) and lack of funding (27 percent). However, executives cited cybersecurity as the most-widely adopted technology across the organization-wide (32 percent). In addition, 25 percent said they are testing pilot programs for cyber security, and 33 percent have developed or are defining strategies for it. Regarding IT/OT integration, more than half of the respondents (56 percent) reported that their organizations are considering merging their IT and OT departments in the next 12 months, which would advance this trend. Mining and metals companies are also continuing to adopt cloud computing technologies broadly. Four in five respondents (81 percent) said their companies have implemented some form of public, private or hybrid cloud, and another 17 percent said their company is exploring the use of cloud technology. Accenture conducted an online survey of 201 C-level and top management executives and functional leaders in the mining and metals industry. The survey was fielded in mid-October through mid-November 2016 and included respondents from Australia, Brazil, Canada, Chile, China/Hong Kong, Indonesia, India, Singapore, South Africa, the United States and United Kingdom. The companies represented have annual revenues ranging from USD $500 million to more than USD $20 billion.